Our Timbertonic Balm is a homogenous mixture of 100% filtered beeswax and mineral oil. Being non-toxic and food safe, it is applied with your hands and the heat of the friction will help with the viscosity of the mineral oil. After the mixture is soaked into the grain and has solidified over time, the excess wax can be removed. See more information under our Services section. 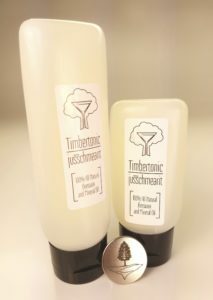 Fill out this form to place an order for our Timbertonic board balm. You’ll receive an invoice containing multiple payment options shortly after placing your order.